"REACT Document Security Paper for printing tickets and coupons"
We Manufacture the Products We Sell ! REACT™ is a unique paper developed for use by commercial printers. REACT™ contains features to allow for document validation. This presents a company with a serious problem. the result is negative advertising. it is almost impossible to balance the books. REACT™ Security Paper Paper is designed for use in both Digital and Offset Printing Presses. Micro Format has the solution ! Sample sheets will be provided upon request. After 2015, the U.P.C. Prefix 5 symbol will no longer to be used on coupons. This bar code will be replaced by GS1 DataBar Code. is the perfect solution for preventing unauthorized coupon duplication. These downloads are made available from GS1.org free of charge as a model for developers and as a 'sampler' for users. When it comes to paper, there are many shades of white and different degrees of brightness. Security White™ is a unique color developed by Micro Format SecureGuard™ paper division. The Security White™ color is the brightest white color in which a security message can be hidden. This unique color incorporates a security feature that becomes visible on a photo copy. Do you have a SPECIAL APPLICATION that requires special security features? Are you preparing a PRESCRIPTION PAD PROGRAM? 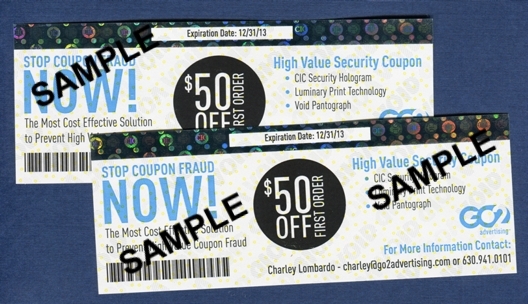 Does your client require COUPONS with the CIC HOLOGRAM? CALL US! We are here to help. We understand printing and may be able to offer money saving suggestions. REACT™ and SecureGuard™ are trademarks owned by Micro Format, Inc.